To Reach Any Height Aluminium Scaffolding components are basically Head aluminium alloy scaffolding Framework required for strength and stability. Aluminium Scaffolding manufactured in 1.5 M, 3M, 6M, 8M, 12M & 18M heights.Aluminium Scaffolding Tower is the combination of ladder and work platform.If steel they are either 'black' or galvanised. Aluminium Scaffolding is used for all departments like Civil base Aluminium Scaffolding, Electrical based aluminium scaffolding and Mechanical based aluminium scaffolding. We are Aluminium Scaffolding manufacturer in various heights measuring from 700 X 600 mm Aluminium scaffolding, 700 X 1000 aluminium scaffolding, 700 X 2000 mm aluminium scaffolding, 1400 X 2000 mm aluminium scaffolding. The basic components of aluminium scaffolding are Pipes,tubes, couplers and boards. We provide professional services include industry based aluminium scaffolding , MEP work based aluminium scaffolding , PEP based aluminium scaffolding and construction based aluminium scaffolding. 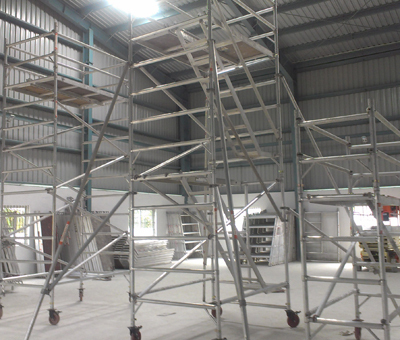 We manufactured and supplied some type of Aluminium scaffolding and supply rental in Chennai, Bangalore, Hyderabad, Ahmedabad,pune. We Support Aluminium Scaffold for all work. 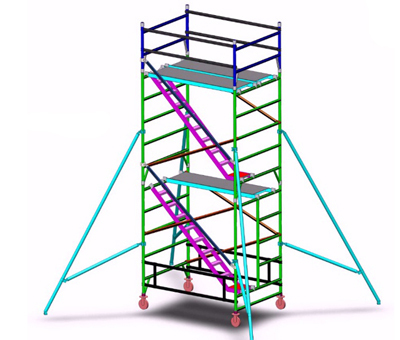 To Reach Any Height Aluminium Scaffolding system is characterized by the attributes such as robust construction, high strength, durability and portability. We use only quality packaging in order to eliminate the risk of any kind of damage. 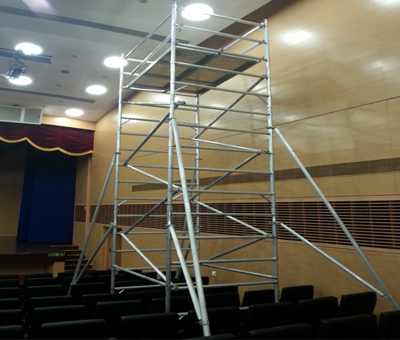 There are some type of scaffolding can be discussed. 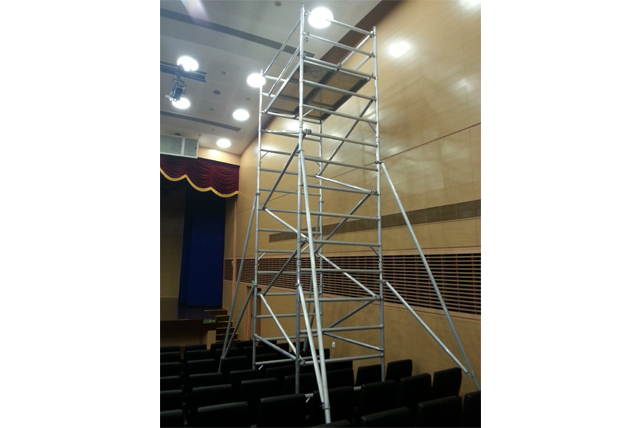 The aluminium access tower scaffolding can be assembled faster and rust proof, easy to maintain and labour-less oriented. It is mainly used in construction applications to build commercial and residential establishments and it is widely demanded across the nation. Rental Sales Service Manufacturer of a wide range of products which include aluminium mobile scaffold, mobile folding scaffold, mobile scaffold tower, aluminium mobile tower scaffold, mobile scaffolding ladder and aluminium mobile tower scaffolding. All channels are comprised of aluminium alloy, step made up of 50mm od 2.5mm thickness ,H outline stature 2000mm width 690mm , lodge stature 1000mm width 690mm , stage measure 540mm x 1780mm with aluminium board sheet , hand rails/flat bar/corner to corner bar dia 50mm x 2mm thickness , gi "u" clamp, nylon wheels with foot slowing mechanisms , external trigger for four side corner (if essential) , non slip, extra grasp level folded mullion steps , top notch leg hold chequered sheet for best of the stage (plywood/aluminium) , most extreme working burden : 180kgs. Our services in Chennai, bangalore, ahmedabad, pune, hyderabad, Delhi. To Reach Any Height All pipes are made up of aluminium alloy HE 30 grade T6 temper. • Step made up of 50mm od 2. 5mm thickness • H frame height 2000mm width 1350 mm • Cabin height 1000mm width 1350 mm • Platform size 580mm x 1690 mm with aluminium chequred sheet • Stairway tube size 25mm x 75mm height 2500mm 8 steps width 3 " • Hand rails / horizontal bar/ diagonal bar dia 50mm x 2mm thickness • Gi "u" clamp, nylon wheels with foot brake systems • Outer trigger for four side corner (if necessary) • Non slip, extra grip flat corrugated mullion steps • High quality leg grip chequred sheet for top of the platform • Maximum working load : 270 kgs. We manufactured and supplied some type of Aluminium scaffolding and supply rental in Chennai, Bangalore, Hyderabad, Ahmedabad, pune, Delhi. To Reach Any Height All channels are comprised of aluminium alloy, step made up of 50mm od 2.5mm thickness ,H outline stature 2000mm width 690mm , lodge stature 1000mm width 690mm , stage measure 540mm x 1780mm with aluminium board sheet , hand rails/flat bar/corner to corner bar dia 50mm x 2mm thickness , gi "u" clamp, nylon wheels with foot slowing mechanisms , external trigger for four side corner (if essential) , non slip, extra grasp level folded mullion steps , top notch leg hold chequered sheet for best of the stage (plywood/aluminium) , most extreme working burden : 180kgs. Our services in Chennai, bangalore, ahmedabad, pune, hyderabad, Delhi. Manufacturing Company India All channels are comprised of aluminium alloy, step made up of 50mm od 2.5mm thickness ,H outline stature 2000mm width 690mm , lodge stature 1000mm width 690mm , stage measure 540mm x 1780mm with aluminium board sheet , hand rails/flat bar/corner to corner bar dia 50mm x 2mm thickness , gi "u" clamp, nylon wheels with foot slowing mechanisms , external trigger for four side corner (if essential) , non slip, extra grasp level folded mullion steps , top notch leg hold chequered sheet for best of the stage (plywood/aluminium) , most extreme working burden : 180kgs.Our services in Chennai, bangalore, ahmedabad, pune, hyderabad. To Reach Any Height All pipes are made up of aluminium alloy HE 30 grade T6 temper. • Step made up of 50mm od 2.5mm thickness • H frame height 2000mm • Width 1350 mm • Cabin height 1000mm • Width 1350 mm • Platform size 580mm x 1690 mm with aluminium chequred sheet stairway • Tube size 25mm x 75mm height 2500mm 8 steps width 3 "hand rails / horizontal bar/ diagonal bar dia 50mm x 2mm thickness gi "u" clamp, • Nylon wheels with foot brake systems outer trigger for four side corner (if necessary) non slip, • Extra grip flat corrugated mullion steps high quality leg grip chequred sheet for top of the platform • Maximum working load : 270 kgs.Our services in Chennai, bangalore, ahmedabad, pune, hyderabad. To Reach Any Height All pipes are made up of aluminium alloy HE 30 grade T6 temper. • Step made up of 50mm od 2.5mm thickness • H frame height 2000mm • Width 1350 mm • Cabin height 1000mm • Width 1350 mm • Platform size 580mm x 1690 mm with aluminium chequred sheet stairway • Tube size 25mm x 75mm height 2500mm 8 steps width 3 "hand rails / horizontal bar/ diagonal bar dia 50mm x 2mm thickness gi "u" clamp, • Nylon wheels with foot brake systems outer trigger for four side corner (if necessary) non slip, • Extra grip flat corrugated mullion steps high quality leg grip chequred sheet for top of the platform • Maximum working load : 270 kgs.Our services in Chennai, bangalore, ahmedabad, pune, hyderabad, Delhi. Our Location Chennai Bangalore Hyderabad Pune Delhi Aluminium Scaffolding components are basically Head aluminium alloy scaffolding Framework required for strength and stability. 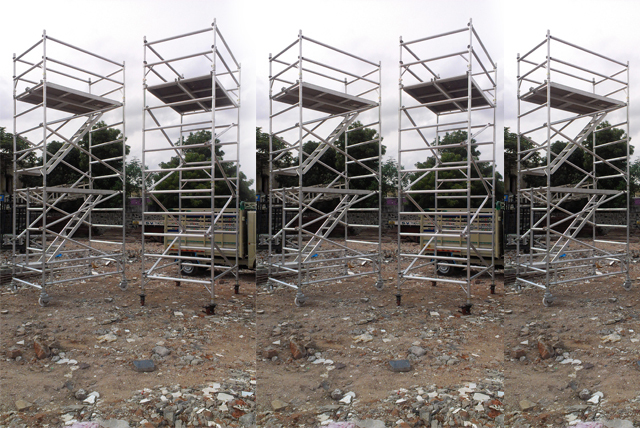 Aluminium Scaffolding manufactured in 1.5 M, 3M, 6M, 8M, 12M & 18M heights.Aluminium Scaffolding Tower is the combination of ladder and work platform.If steel they are either 'black' or galvanised. Aluminium Scaffolding is used for all departments like Civil base Aluminium Scaffolding, Electrical based aluminium scaffolding and Mechanical based aluminium scaffolding. We are Aluminium Scaffolding manufacturer in various heights measuring from 700 X 600 mm Aluminium scaffolding, 700 X 1000 aluminium scaffolding, 700 X 2000 mm aluminium scaffolding, 1400 X 2000 mm aluminium scaffolding. The basic components of aluminium scaffolding are Pipes,tubes, couplers and boards. We provide professional services include industry based aluminium scaffolding , MEP work based aluminium scaffolding , PEP based aluminium scaffolding and construction based aluminium scaffolding. 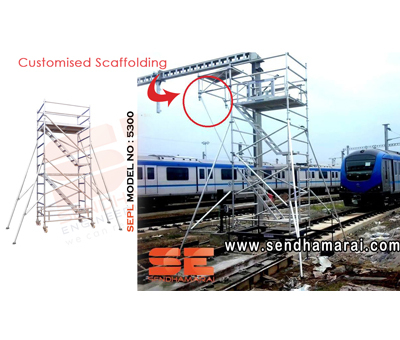 We manufactured and supplied some type of Aluminium scaffolding and supply rental in Chennai, Bangalore, Hyderabad, Ahmedabad,pune. 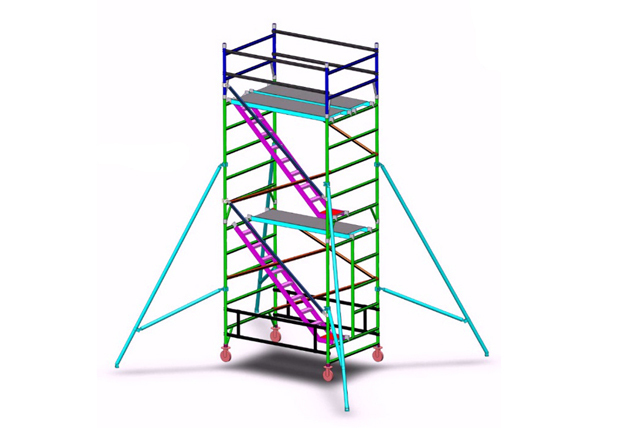 To Reach Any Height The aluminium access tower scaffolding can be assembled faster and rust proof, easy to maintain and labour-less oriented. It is mainly used in construction applications to build commercial and residential establishments and it is widely demanded across the nation. Tube to tube joints make frames lighter. Frame horizontals have 500 mm spacing and ribbed tubing for increased grip. 3t - through the trap build method. Frame widths of 850mm & 1450mm. 2 deck lengths: 1. 8m & 2. 5m. Self-closing trapdoors & wind lock clips. Safe working load of 275 kg per platform level up to maximum of 950 kg per tower. Double action trigger operated locking claws. Floating spigots for easy assembly & dismantling. 150mm trail/no trail locking castors We manufactured and supplied some type of Aluminium scaffolding and supply rental in Chennai, Bangalore, Hyderabad, Ahmedabad,pune. Lifing Equipment For Sales Service Rental Genie Articulated Boom Lift DC and Bi-Energy machines offer quiet, emission-free operation in the most sensitive work environments. For industrial applications where the machine must be driven significant distances, the Genie Boom Lift bi-energy system combines the benefits of a 48V DC machine with the versatility of a diesel-powered generator. 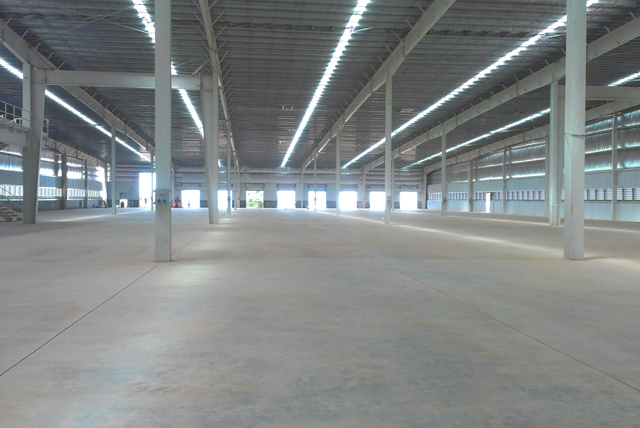 and supply rental in Chennai, Bangalore, Hyderabad, Ahmedabad,pune. Genie Articulating boom lift is ideal for outdoor construction and industrial applications Genie engine-powered articulating Z™ boom lift provide lifting versatility with a combination of up, out and over positioning capabilities and outreach that's second to none. Genie Telescopic boom Lift offer greater horizontal outreach than any other type of aerial platform — perfect for areas with limited access in industrial applications. Genie telescopic boom lift model S™-boom lift are also designed for productivity with the traction and drive speed you need to get around the job site and to the work area. To Reach Any Height With Us Rental Sales Service Genie Articulating Boom Lift DC and Bi-Energy machines offer quiet, emission-free operation in the most sensitive work environments. For industrial applications where the machine must be driven significant distances, the Genie Boom Lift bi-energy system combines the benefits of a 48V DC machine with the versatility of a diesel-powered generator. and supply rental in Chennai, Bangalore, Hyderabad, Ahmedabad,pune. Genie Articulating boom lift is ideal for outdoor construction and industrial applications Genie engine-powered articulating Z™ boom lift provide lifting versatility with a combination of up, out and over positioning capabilities and outreach that's second to none. Genie Telescopic boom Lift offer greater horizontal outreach than any other type of aerial platform — perfect for areas with limited access in industrial applications. Genie telescopic boom lift model S™-boom lift are also designed for productivity with the traction and drive speed you need to get around the job site and to the work area. To Reach Any Height With Us Genie Articulating Boom Lift 30' Electric DC and Bi-Energy machines offer quiet, emission-free operation in the most sensitive work environments. For industrial applications where the machine must be driven significant distances, the Genie Boom Lift bi-energy system combines the benefits of a 48V DC machine with the versatility of a diesel-powered generator. We supply rental in Chennai, Bangalore, Hyderabad, Ahmedabad,pune. Genie Articulating boom lift is ideal for outdoor construction and industrial applications Genie engine-powered articulating Z™ boom lift provide lifting versatility with a combination of up, out and over positioning capabilities and outreach that's second to none. Genie Telescopic boom Lift offer greater horizontal outreach than any other type of aerial platform — perfect for areas with limited access in industrial applications. Genie telescopic boom lift model S™-boom lift are also designed for productivity with the traction and drive speed you need to get around the job site and to the work area. Boom Lift Rental Sales Service Genie Articulating Boom Lift 45' 4WD Electric DC and Bi-Energy machines offer quiet, emission-free operation in the most sensitive work environments. For industrial applications where the machine must be driven significant distances, the Genie Boom Lift bi-energy system combines the benefits of a 48V DC machine with the versatility of a diesel-powered generator. We supply rental in Chennai, Bangalore, Hyderabad, Ahmedabad,pune. Genie Articulating boom lift is ideal for outdoor construction and industrial applications Genie engine-powered articulating Z™ boom lift provide lifting versatility with a combination of up, out and over positioning capabilities and outreach that's second to none. Genie Telescopic boom Lift offer greater horizontal outreach than any other type of aerial platform — perfect for areas with limited access in industrial applications. Genie telescopic boom lift model S™-boom lift Manufacturer are also designed for productivity with the traction and drive speed you need to get around the job site and to the work area. To Reach Any Height With Boom lift Genie Articulating Boom Lift for sales Electric DC and Bi-Energy machines offer quiet, emission-free operation in the most sensitive work environments. For industrial applications where the machine must be driven significant distances, the Genie Boom Lift bi-energy system combines the benefits of a 48V DC machine with the versatility of a diesel-powered generator. We supply rental in Chennai, Bangalore, Hyderabad, Ahmedabad,pune. Genie Articulating boom lift is ideal for outdoor construction and industrial applications Genie engine-powered articulating Z™ boom lift provide lifting versatility with a combination of up, out and over positioning capabilities and outreach that's second to none. Genie Telescopic boom Lift offer greater horizontal outreach than any other type of aerial platform — perfect for areas with limited access in industrial applications. Genie telescopic boom lift model S™-boom lift are also designed for productivity with the traction and drive speed you need to get around the job site and to the work area. 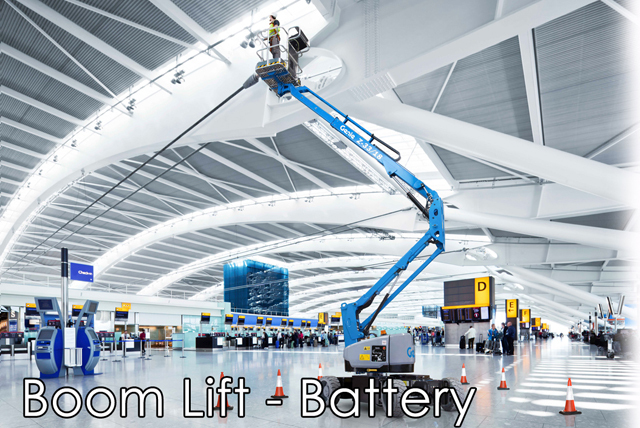 To Reach Any Height With Boom Lift Sales / Rental Genie Articulating Boom Lift Rental price Electric DC and Bi-Energy machines offer quiet, emission-free operation in the most sensitive work environments. For industrial applications where the machine must be driven significant distances, the Genie Boom Lift bi-energy system combines the benefits of a 48V DC machine with the versatility of a diesel-powered generator. We supply rental in Chennai, Bangalore, Hyderabad, Ahmedabad,pune. Genie Articulating boom lift is ideal for outdoor construction and industrial applications Genie engine-powered articulating Z™ boom lift provide lifting versatility with a combination of up, out and over positioning capabilities and outreach that's second to none. Genie Telescopic boom Lift offer greater horizontal outreach than any other type of aerial platform — perfect for areas with limited access in industrial applications. Genie telescopic boom lift model S™-boom lift are also designed for productivity with the traction and drive speed you need to get around the job site and to the work area. To Reach Any Height Genie Articulating Boom Lift Electric DC and Bi-Energy machines offer quiet, emission-free operation in the most sensitive work environments. For industrial applications where the machine must be driven significant distances, the Genie Boom Lift bi-energy system combines the benefits of a 48V DC machine with the versatility of a diesel-powered generator. We supply rental in Chennai, Bangalore, Hyderabad, Ahmedabad,pune. Genie Articulating boom lift is ideal for outdoor construction and industrial applications Genie engine-powered articulating Z™ boom lift provide lifting versatility with a combination of up, out and over positioning capabilities and outreach that's second to none. Genie Telescopic boom Lift offer greater horizontal outreach than any other type of aerial platform — perfect for areas with limited access in industrial applications. Genie telescopic boom lift model S™-boom lift are also designed for productivity with the traction and drive speed you need to get around the job site and to the work area. 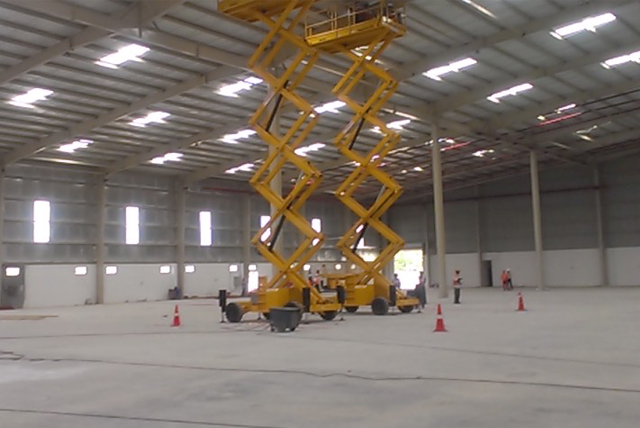 To Reach Any Height Boom lift Rental Sales Near Me Genie Articulating Boom Lift Electric DC and Bi-Energy machines offer quiet, emission-free operation in the most sensitive work environments. For industrial applications where the machine must be driven significant distances, the Genie Boom Lift bi-energy system combines the benefits of a 48V DC machine with the versatility of a diesel-powered generator. We supply rental in Chennai, Bangalore, Hyderabad, Ahmedabad,pune. Genie Articulating boom lift is ideal for outdoor construction and industrial applications Genie engine-powered articulating Z™ boom lift provide lifting versatility with a combination of up, out and over positioning capabilities and outreach that's second to none. Genie Telescopic boom Lift offer greater horizontal outreach than any other type of aerial platform — perfect for areas with limited access in industrial applications. Genie telescopic boom lift model S™-boom lift are also designed for productivity with the traction and drive speed you need to get around the job site and to the work area. To Reach Any Height Genie Articulating Boom Lift 30' Electric DC and Bi-Energy machines offer quiet, emission-free operation in the most sensitive work environments. For industrial applications where the machine must be driven significant distances, the Genie Boom Lift bi-energy system combines the benefits of a 48V DC machine with the versatility of a diesel-powered generator. We supply rental in Chennai, Bangalore, Hyderabad, Ahmedabad,pune. Genie Articulating boom lift is ideal for outdoor construction and industrial applications Genie engine-powered articulating Z™ boom lift provide lifting versatility with a combination of up, out and over positioning capabilities and outreach that's second to none. Genie Telescopic boom Lift offer greater horizontal outreach than any other type of aerial platform — perfect for areas with limited access in industrial applications. Genie telescopic boom lift model S™-boom lift are also designed for productivity with the traction and drive speed you need to get around the job site and to the work area. To Reach Any Height Genie Aerial Work Articulating Boom Lift Platform Electric DC and Bi-Energy machines offer quiet, emission-free operation in the most sensitive work environments. For industrial applications where the machine must be driven significant distances, the Genie Boom Lift bi-energy system combines the benefits of a 48V DC machine with the versatility of a diesel-powered generator. We supply rental in Chennai, Bangalore, Hyderabad, Ahmedabad,pune. Genie Articulating boom lift is ideal for outdoor construction and industrial applications Genie engine-powered articulating Z™ boom lift provide lifting versatility with a combination of up, out and over positioning capabilities and outreach that's second to none. Genie Telescopic boom Lift offer greater horizontal outreach than any other type of aerial platform — perfect for areas with limited access in industrial applications. Genie telescopic boom lift model S™-boom lift are also designed for productivity with the traction and drive speed you need to get around the job site and to the work area. To Reach Any Height Genie Articulating Boom Lift Platform Safety Electric DC and Bi-Energy machines offer quiet, emission-free operation in the most sensitive work environments. For industrial applications where the machine must be driven significant distances, the Genie Boom Lift bi-energy system combines the benefits of a 48V DC machine with the versatility of a diesel-powered generator. 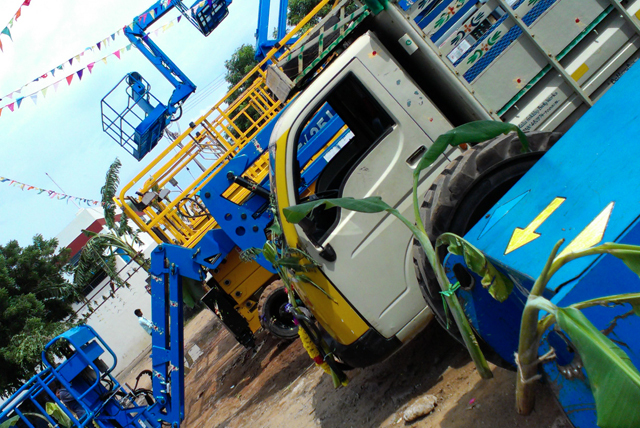 We supply rental in Chennai, Bangalore, Hyderabad, Ahmedabad,pune. Genie Articulating boom lift is ideal for outdoor construction and industrial applications Genie engine-powered articulating Z™ boom lift provide lifting versatility with a combination of up, out and over positioning capabilities and outreach that's second to none. Genie Telescopic boom Lift offer greater horizontal outreach than any other type of aerial platform — perfect for areas with limited access in industrial applications. Genie telescopic boom lift model S™-boom lift are also designed for productivity with the traction and drive speed you need to get around the job site and to the work area.